A bit of quirkiness goes a long way when it comes to decorating a room. Be it a print, ornament or soft furnishing you can’t help but be drawn in to examine it closer. Ben Javens of Eye Spy does just the right amount of quirkiness for my liking. His prints are beautifully screen printed by hand and show off the most gorgeous colours. Everything from apples to elephants is on offer. I love the dark Blue Moon print with its charming moon peering down on the couple below. My favourite though are the cushions (pictured top). I can’t decide which I love more, the Aeroplane or the Face It, so there’s nothing else for it, I’ll have to have both. Each funky pattern is screen printed to form a generous fifty centimetre sized cushion, perfect for nestling into. 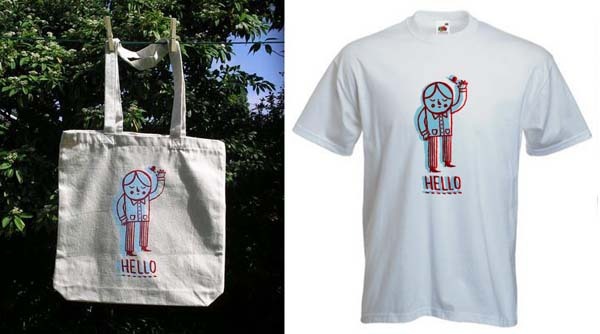 Of course if cushions and prints aren’t your thing then there are also groovy Hello totes and tees (pictured below) on offer. Both the Aeroplane and Face It cushions will set you back £20. Email Ben through the contact page at Eye Spy for shipping options to Australia.